I have tried using the search function but I wasn't able to find an answer to this question, so bear with me if it's been repeated before. I worked for years in the Harvard University library system, in special collections (rare books and archives), and iron gall ink was notorious for eating away at the paper substrates. I could easily put my hands on manuscripts that had been written in iron gall inks, in which the ink ate through the paper and left mostly sheets of what looked like laser cut lace. The acidity of the ink destroyed the paper, even robust quality handmade rag papers from the 17th century and such. Similarly, I've seen reproductions of J.S. Bach manuscripts that are also nothing but paper and air now. So, when I first started exploring fountain pen inks, I steered clear of modern iron gall inks. I didn't consider them a risk to my pens. It was my letters and journals that I wanted to preserve! But as these inks keep growing in popularity, I have to ask... are they different enough from older inks to be safe for paper? They appear to be acidic by intrinsic nature (you can't have an alkaline iron gall ink, any more than you can have an acidic soap...). And recently, I bought a bottle of Rohrer and Klinger Scabiosa, and I love it for sketching... but... I'm still afraid to use it for anything I want to stick around. Have there been any accelerated aging tests on this stuff? Any way to predict how it might react with papers today? From what I know, current iron-gall inks are still quite acidic. I'm not sure how documents written in it would fare many years from now, I'd imagine that many years later, we would see some paper with holes in it in a similar fashion to what you have seen. I *think* that IG inks were best used on alkaline vellum - such as the Book of Kells, which is still in relatively good condition. IG is apparently completely unsuitable for paper. For vellum, I've read it's very good. Ah, I was afraid of this. But mention of the alkaline-buffered vellum is interesting. There are a lot of pH-buffered papers in use today. Twenty years ago, when the magnitude of the brittle book problem became apparent (late 19th-20th c. books printed on acidic paper were crumbling into dust, threatening huge chunks of our human record), there was a big push by groups like the Library of Congress and book publishers to improve the quality of copy and printing papers to avoid the problem in the future. I remember when we got our first case of acid-free copy paper in my Harvard office... it felt a bit like UPS dropped off the Holy Grail. But soon, more and more copy papers were testing alkaline, even ones that weren't labeled "acid-free" on the package. It turns out that the manufacturing changes that produced alkaline-buffered papers were more economical than the older, acidic methods. And my boss said that we could probably expect nearly all white office paper to eventually be archival (i.e. pH-buffered) as a matter of course. That was twenty years ago, though, and I've been out of the library biz for a while. I don't know how much buffering (if any) is in today's typical papers, and I don't know how much buffering might be needed to counteract the acidic effects of iron gall ink. It's sadly ironic that some of the inks people are trying to insure preservation against water damage could actually destabilize the paper they're written on. According to studies I have read (I can supply a list of references if needed), the acidity of ink alone does not cause the deteration of the paper nor the iron but combination of these two. Iron gall ink formulas from ~1900s forwards have addressed these issues and even all of the thin paper manuscripts of this era and afterwards I have seen are in good or excellent condinition from the ink's point of view. You might want to search the threads and try fpn member Pharmacist's i-g inks. a) incorrect proportions during ink making. Iron-gall itself is stable (uneaten manuscripts attest to that). But ingredients left over that didn't react properly could eat paper. Also, I'm told that registrars ink is mandatory for signing legal documents in UK (e.g. marriage licenses). If that's not enough, you'll probably want to stick with something like the nano-carbon inks. As WallyLynn says, Iron Gall is required for all Church Registrars in England. Modern Iron Gall inks are not the problem that homemade IG inks are. I think the current I-G inks that are designed for use in fountain pens are well-formulated to avoid problems encountered with olde tyme quill / dip pen inks that have attacked the paper. As mentioned, in some places the use of I-G inks is mandated, so we have several brands of Registrars Ink. I believe that Montblanc and R&K also claim archival properties for their I-G inks. As to the paper, I agree that most common writing and printer/copy papers today are quite stable, but a well-stocked stationers shelves contain many coloured, coated, and artisan handmade papers that I would be reluctant to use for an enduring document. In the exceedingly rare case that I want to create an enduring document, I reach for a 100% cotton rag paper. At times I've used Arches hot press watercolour paper which can be had in heavy weights on a single [large] sheet basis from most art supply shops. Also, sources such as a national archive may well offer guidance, as might a Calligraphers Guild. Edited by Sandy1, 30 July 2012 - 18:39. Pharmacist, the local maker of IG inks, may be best qualified to comment on this. My understanding is that where modern IG inks distinguish themselves from historical inks is that most have a very small IG content (with the exception of Pharmacist's IG ink). Where the more important differences start to come in is in that modern IG inks are more likely to have a formulation which is stoichiometrically correct. This was not the case for historical inks - often there was excess acid which was not consumed in the oxidation of the IG compound. Excess acid is of course a bad thing. A further factor is the kind of acid used. A lot of historical inks used sulphuric acid, whereas modern inks tend to use hydrochloric acid. Hydrochloric acid is a gas in solution, which will evaporate. As a result, modern IG inks are less likely to damage paper than historical inks were. Pharmacist can probably explain this much better than I can. A further factor is the kind of acid used. A lot of historical inks used sulphuric acid, whereas modern inks tend to use hydrochloric acid. There are probably a lot of inks made using acetic acid (i.e. vinegar) and showing corrosion but little or some inks made with sulphuric acid showing little or no corrosion. There has to be always excess amount of iron and/or other metals in the ink to cause corrosion (Ink Corrosion: Chemistry). Further the use of acid will actually prevent or stop the corrosion of the metal nibs and slow down the sedimentation process. I make homemade iron gall inks, and while it's only been about a year and a half into the experiment, my ink made from aleppo oak galls, with a ratio of 3 parts tannic/gallic acid to 2 parts iron sulfate, has produced a stable ink so far with no signs of fading in my sunshine tests (you can't say that about commercial fountain pen iron gall inks, which do in fact fade). It's too early to say if it will eat the paper over time, but I used a recipe by Dr. James Stark, a chemist in the 1800's, who tested iron gall inks for 20 years to see what recipes were the most stable. His conclusion was a 3:2 ratio of tannic/gallic acid to iron sulfate was the most stable. A good recipe is vital. We're not likely to learn the recipes of commercial iron gall ink manufacturers, however. 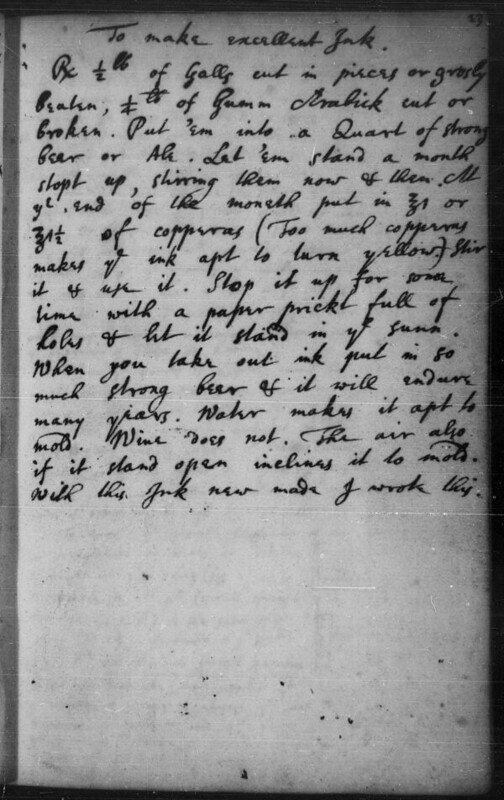 Vignette recently posted Sir Isaac Newton's iron gall ink recipe in this thread. What's impressive is how black the ink still looks (not brown like other iron gall ink manuscripts over time). There don't appear to be any signs of deterioration of the paper that I can see, either. I'd say this is a stable recipe. Your best bet is to make iron gall ink, yourself, so you can control what goes into it. Avoid additives like logwood, which degrade the ink over time. Stark also mentioned steel will age and ruin any ink, so a quill or glass pen is best. So as you can see, there are many variables that go into consideration regarding the stability of ink. I've also made the Jane Austen iron gall ink recipe, and within a year it started to show signs of browning (and her manuscripts are all brown, too). Also, if an iron gall ink is continued to be used after it has dropped sediment, this will also be a compromised ink and affect longevity/stability. Edited by fiberdrunk, 31 July 2012 - 05:56. I have done some reading on the subject. The best information I have found came from a paper written about "paper corrosion". It seems that iron gall inks generate sulphuric acid in the process of making the black pigment. The acid breaks down the paper in a kind of circular reaction where the acid is continuously regenerated, almost like a catalyst. So, no matter how carefully the ink is made, the iron sulfate component will make the acid and eventually eat through the paper. Vellum and parchment are attacked by the acid also. For this reason, I gave up on the iron gall project for record permanence. I am using India ink for my journals. Carbon is forever. It might be but it will not stick to the paper forever. Check Codex Sinaiticus and Codex Vercellensis for proof that proper iron gall ink will stand for thousands of years and does not completely deteriorate the medium at the same time. Notice that the ancient parchment is probably more acidic than modern paper due of the manufacturing process. Do you not think this is long enough for your purposes? What a great website! If only the people who created that manuscript had included their ink recipes somewhere, too! I found it interesting that the inks did better on the hair side of the parchment than the flesh side. Very interesting. From what I understand, most carbon inks are not waterproof (the ones typically safe for fountain pen use). I wonder if the shellac in the waterproof carbon inks are problematic for longevity? The latter, of course, must be used with a dip pen (not a problem, of course, if you like dip pens), or if you're lucky enough to have an Osmiroid India Ink Fountain Pen (a Pilot Parallel might work with India ink, too, with prompt clean-up.) I do like Speedball India Ink. Calli makes a nice India Ink, too. Don't technical pens work with india ink? Once again I wish the reply button would be removed from the top of the page. Yes. I have some ancient Rotring Variant tech pens that I use Speedball India Ink in. I'm assuming modern ones can, too. "The Codex Sinaiticus inks have never been chemically characterized, and the type and proportions of ingredients mixed together have never been determined. Therefore, the composition of the writing media can only be roughly guessed by observing their visible characteristics and their degradation patterns." I am a writer, not an ink chemist. The leachate from galls could be an extremely complicated brew of chemicals that varies from year to year and from place to place. Finding and verifying the proper combination would take thousands of years that I don't have. Storage conditions will produce even more variables. Forget it! Properly made carbon ink does not just sit on the surface of paper. It will soak down among the paper fibers and be protected from abrasion and most water damage (I know. I have done the experiments.). Writing done with it will last longer than the paper it is written on. In my estimation, its selection is a no-brainer. Diamine, Ecclesiastical Stationery Supplies, Rohrer und Klingner and whoever makes for Akkerman do not start with oak galls; they use properly sourced chemicals with known concentrations. Nothing is left to chance. Properly made carbon ink does not just sit on the surface of paper. It will soak down among the paper fibers and be protected from abrasion and most water damage (I know. I have done the experiments.). Writing done with it will last longer than the paper it is written on. In my estimation, its selection is a no-brainer. What brand of carbon ink have you found to work for you? Very interesting! Seems risky to use on marriage documents? What's the point of that requirement? Why not require the use of say a Noodler's eternal line of inks instead? I don't understand the need for iron-gall inks - is it all about the rapid drying or the supposed permanence?